The first 25 games started out with 75% 3:5:7 bottom tier. And then the next 25 battles balanced it out. 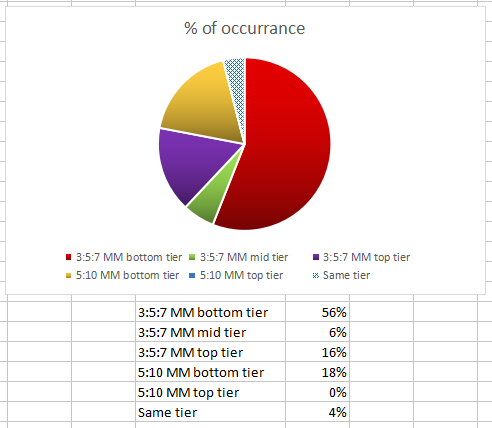 This shows that 50 battles is the minimum to get accurate tier data with reasonable variance. Also shows the 20-battle rule in action. Question mark behind the "im" means I'm not sure if I would have mattered. 6 question marks behind "im" means Ace Tanker on a defeat. I'm not sure how to consider these - I could have won if I played just a tiny bit better (or if I had grey-area mods like zoomout mod), some of it was lost due to bad RNG or the accumulation of a few bad RNGs. On the other hand this is already way beyond how much a single player is supposed to be able to contribute, and would have required lots of lucky RNGs. I can put it this way - If I did this much and still can't win, this battle can be considered one of those that are impossible to win. For the most part, the 40-40-20 rule remains somewhat accurate. 50 battles results in high uncertainty due to 20-battle rule. There seems to be no clear pattern of "im" vs MM tiering. Although this could be due to the tank - Pantera has no armor and so cannot push when top tier. But this can be due to small number of battles too - Most of the 357 top tier losses were blatant landslides, one even had a 357 top tier camping at base teamkilling arty. Winrate for 50 battles = 50%, which is around what I expect for this unfortunate piece of junk. Even though I have 2 Ace Tankers within this 50 battles. This is actually really good work mate, have a +1. What was the server population like when you were playing those games Blue? I really don't know about the 20 game rule. Past evidence suggests almost no one randomly achieves 20- or even 10-game win streaks. There is some logic behind the 20 game rule. If you were to assume a 50% win rate and a random distribution of results, your chances of getting a 10 win streak are 0.5^10 which is about one in a thousand. Most of us have played several thousand battles, so should expect a few streaks of ten games or more to occur in that, with an obvious effect on short term win rates. However, your chances of getting a 20 win streak are 0.5^20 which is one in a million, and none of us have played that many battles. Indeed, with very few players topping 100,000, you could probably make it the 17-game rule, but 20 makes for a nice round number. My first 10 game win streak was soon followed by a 10 game losing streak, so the next time I won ten in a row.. I logged out for 3 months and MM forgot all about me!!! But that is a falsity assuming that the MM is random, when all evidence has shown that it is not. I record the results of almost every battle, and while I have never had a win streak over 10, i have had multiple loss steaks over 20. There is nothing random about it. I can tell you with almost 100% accuracy the result of any battle during the loading screen, and in 99% of cases it will not matter where I go, what tank I pick or how well I play, that result will hold true. I'm not saying the matchmaking algorithm is random, as it obviously isn't. Rather, I'm assuming that the distribution of results is, and unless you have some means of predicting what the outcome of the battle is going to be before you've seen the loading screen, with any greater accuracy than your recent win-rate, I'd think that that's entirely reasonable. Also, I might not have stressed this enough, but statistical analysis only tells us what's probable. It's still entirely possible for someone to have a very long streaks; it's just that the likelihood of them is sufficiently low for the majority of players to infer their win rate trend by allowing for 20 battles either way with some degree of confidence. One wonders whether not running xvm for a few thousands of battles would change that. Lose streaks tend to appear in a huge row, while win streaks tend to have a few losses splattered here and there. I believe it can be explained with the fact that to win, you need a good team + good personal performance, while to lose, you just need either a bad team or bad personal performance. Suppose you got lucky and have epic teams in a row, you can still lose because you flip your tank or something. But if you have noob teams in a row, well god help you. On the other hand, assuming you are a good player, you would tend to have longer periods of high winrate % to balance out the short (?) lose streaks so your average remains high. If a set of 20 battles has an unexplainably high % of wins or lose, it is still the 20-battle rule in action. Also, the 20-battle rule isn't specific to winning/losing, it is applicable to everything. 20 tier X battles in a row, something like that. 20 bad teams in a row... or a huge % of it. Point of the 20-battle rule, which itself is not something arising from explanations but rather something that came as a result of observations, is that for anything you're trying to observe in World of Tanks, unexplainable variations can last for as long as 20 battles. When there are lots of random factors for a single thing, these factors will interact and result in long periods of oscillatory motion/result. This is just science/maths/statistics at work. Edited by Aoyama_Blue_Mountain, 10 August 2018 - 03:14 PM. Being part of an experiment means you are inherently part of the result. Hence the need for a blind iteration. Having XVM on or off does not affect my ability in the game and neither does it change what I do or don't do, thus it does not affect the result? I can tell you with almost 100% accuracy the result of any battle during the loading screen, and in 99% of cases it will not matter where I go, what tank I pick or how well I play, that result will hold true. Well the only way to find out for sure would be to test that. Maybe xvm win%. Its really accurate. When you start winning, your mind starts assuming that your next game will be a loss, so to compensate you start to play safer, and thus by playing safer you are more likely to win your next battle. When you start losing, your mind starts assuming that your next game will be a win, so you get frustrated/un-mojo-ed and play sloppier, and thus by playing sloppier you are more likely to lose your next battle. Do note that this is more an issue about cognition, so ironically this means that the less you notice (or care) for your winning or losing streak, the less likely you are going to get a winning or losing streak in the first place. The subconscious can be a jerk like that. I would be really interested if there were some way to take a random sampling of a reasonable number of players (say 100+) to see the length and frequency of their loss streaks as compared to their win streaks over a period long enough to provide good data (say 1000 matches?). I think the results would be quite revealing. Edited by FramFramson, 11 August 2018 - 06:08 AM.